Apoptosis is a genetically determined process of cell self-destruction to maintain its own internal environment under physiological or pathological conditions, while it is accompanied by a series of morphological and biochemical changes, including pyknosis, DNA fragmentation, cell membrane remodelling&blebbing, cell shrinkage, formation of apoptotic bodies and so on. Lastly, apoptotic cells are swallowed up by macrophages and die. Apoptosis is a normal death process of cell involving gene activation, expression and regulation, which is intent to adapt to its internal and external environment. In whole process of apoptosis, the plasma membrane still remain intact and does not cause any leakage of cytoplasm or inflammatory response. 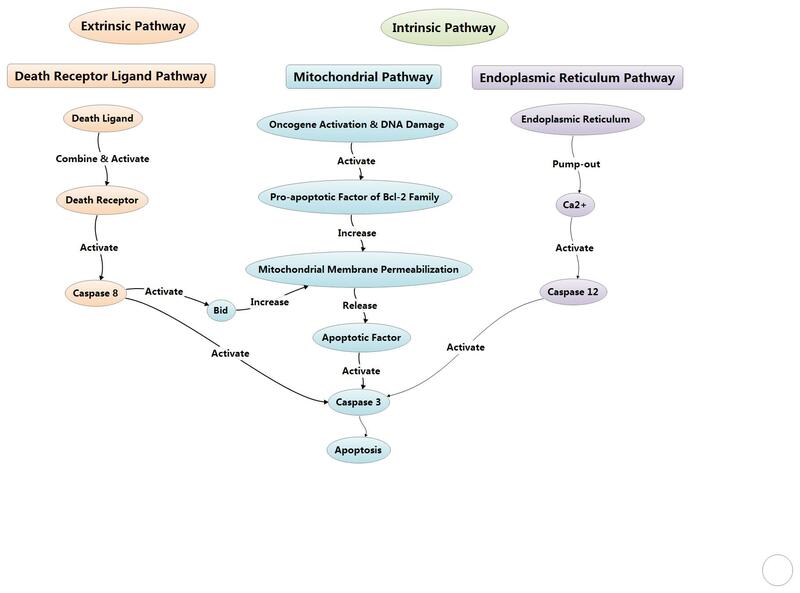 Apoptosis pathways fall into endogenous mitochondrial pathway, endogenous endoplasmic reticulum pathway and exogenous death receptor pathway. Meanwhile, apoptosis process also can be mediated by granzyme B under certain conditions. The endogenous mitochondrial pathway in cells can be activated by death ligand or when cells are suffering from apoptotic stimulating factors to cause the death of cells. The stimulating factors include oncogene activation, DNA damage, cell hypoxia, cell growth factor deletion, and so on. As for this pathway, Bcl-2 family could control the mitochondrial outer membrane permeabilization via adjusting membrane potential. 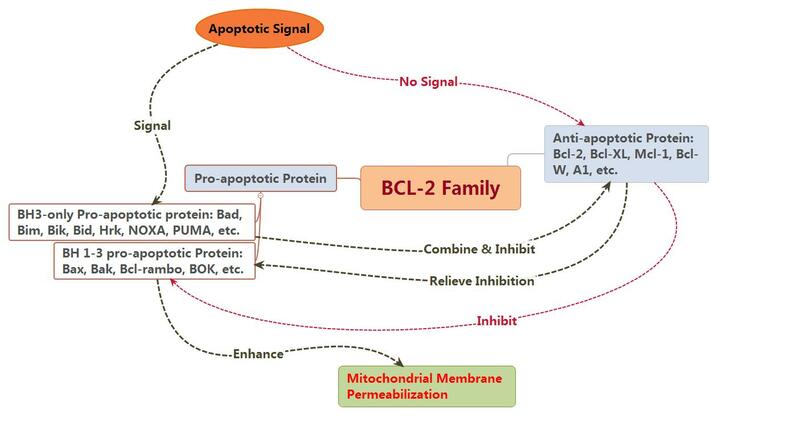 BCL-2 family proteins are the regulators of apoptosis, which consists of anti-apoptotic and pro-apoptotic members, and could control apoptosis by governing mitochondrial outer membrane permeabilization (MOMP). The pro-apoptotic protein can be divided into BH1-3 and BH3. The member of pro-apoptotic protein, such as Bak, together with other members of anti-apoptotic protein, such as Bcl-2 and Bcl-xL, all of them are mainly found in mitochondrial membrane. Other members such as Bid and Bad are mainly found in cytoplasm. Usually, Bax is mainly found in cytoplasm, when receiving apoptotic signal, which could relocating on the surface of mitochondria and form transmembrane pore to reduce membrane potential and increase membrane permeability as well, finally, cause the release of apoptosis factor. At present, there are two hypotheses for the activated ways of Bax and Bak: direct and indirect modes. Indirect mode: usually, the activity of Bax and Bak is inhibited by anti-apoptotic protein, so which could be activated in-directly if the anti-apoptotic activity has been inhibited by the members of BH-3only family after receiving apoptotic signal. Direct mode: BH3-only can be divided into activated protein and kinase protein. The activated protein which have not received apoptotic signal could combine with anti-apoptotic protein to inhibit the activation of Bax and Bak. In contrast, both Bax and Bak could be activated directly if kinase protein combines with anti-apoptotic protein to release activated protein as soon as receiving apoptotic signal. In conclusion, Bcl-2 family comprises anti-apoptotic and pro-apoptotic members, which interacts with each other and determines together whether the cells go into apoptosis process or not. The mitochondrial membrane potential reduction and membrane permeability increasing could cause the release of endogenous mitochondrial apoptotic factors, including CytC, AIF, SMAC/DIABLO, HTRA2/OMI and ENDOG. Cyt C interacts with Apaf-1 after releasing into cells, to form apoptosis complex with the help of ATP and dATP. 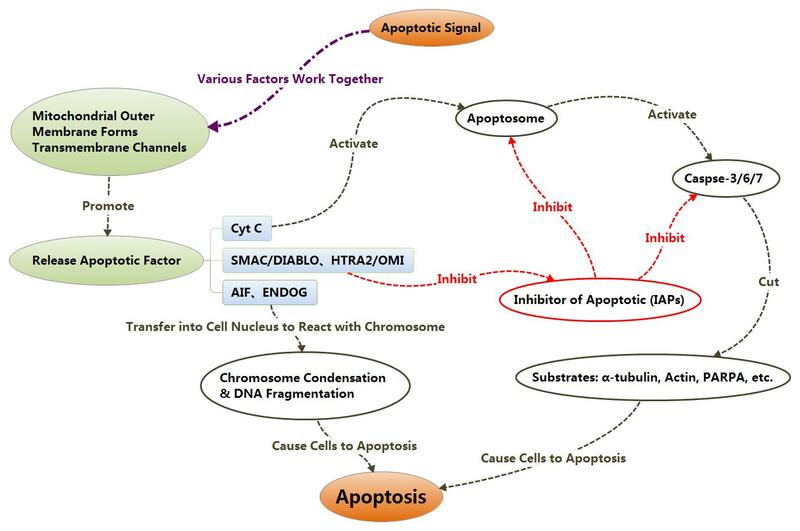 Then apoptosis complex combines with Pro-Caspase9 as well as activates it to form Caspase9. Next, Caspase9 could cause a further activation for both Caspase3 and Caspase7 to start Caspase cascade reaction and cut more than 100 kinds of substrate in cells, such asα-tubulin, Actin, PARPA, Lamin, etc. Finally, the series of reactions cause apoptosis. IAPs could inhibit the activation of Caspase3 and Caspase7 to inhibit cell apoptosis. After releasing themselves from mitochondrion into cytoplasm, SMAC/DIABLO and HTRA2/OMI could combine with IAPs to relieve the inhibition of apoptosis from IAPs, thereby, promote apoptosis indirectly. With the change of mitochondrial membrane potential, AIF and ENDOG also could be released into cytoplasm, then transferred into cell nucleus to trigger chromosome condensation and DNA fragmentation as well, finally, causing apoptosis. Brenner D, Mak T W. Mitochondrial cell death effectors [J]. Current Opinion in Cell Biology, 2009, 21: 871-877. Chalah A, Khosravi-Far R. The mitochondrial death pathway [J]. Advances in Experimental Medicine and Biology, 2008, 615: 25-45. Lindsay J, Esposti M D, Gilmore A P. Bcl-2 proteins and mitochondria—Specificity in membrane targeting for death [J]. Biochimica et Biophysica Acta, 2011, 1813: 532-539. 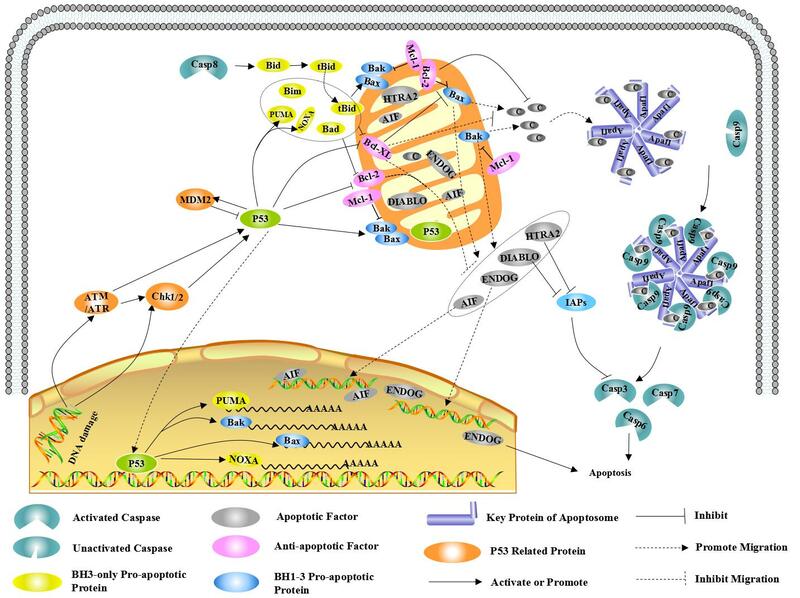 Ola M S, Nawaz M, Ahsan H. Role of Bcl-2 family proteins and caspases in the regulation of apoptosis.[J]. Molecular and Cellular Biochemistry, 2011, 351: 41-58. Pradelli L A, Bénéteau M, Ricci J E. Mitochondrial control of caspase-dependent and -independent cell death [J]. Cellular and Molecular Life Sciences, 2010, 67: 1589-1597. Rong Y, Distelhorst C W. Bcl-2 protein family members: versatile regulators of calcium signaling in cell survival and apoptosis [J]. Annual Review of Physiology, 2008, 70: 73-91. Speidel D. Transcription-independent p53 apoptosis: an alternative route to death [J]. Trends in Cell Biology, 2010, 20: 14-24. Suen D F, Norris K L, Youle R J. Mitochondrial dynamics and apoptosis [J]. Genes & Development, 2008, 22: 1577-1590. Danial N N, Korsmeyer S J. Cell Death: Critical Control Points [J]. Cell, 2004, 116: 205-219. Green D R, Kroemer G. The pathophysiology of mitochondrial cell death [J]. Science, 2004, 305: 626-629.